geViews is a division of Gordon Ellis and Co. A specialist British manufacturer and supplier of street furniture products that combine good looks, meticulous attention to detail and the best possible build quality. Our highly skilled designers can make a product bespoke to your needs, or you can choose from our extensive stocked collection of planters, bins, noticeboards and bollards. 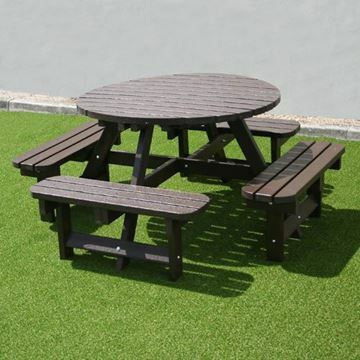 The range is designed to perfectly suit commercial or educational facilities, street scene and ‘in Bloom’ groups. All our products have been designed and developed to give a long life of service. They are great value for money, require the minimum of maintenance and are recyclable. All of which is backed up with our commitment and dedication to deliver the highest standard of customer service. We have a variety of planters that are good for the environment and great for your budget. Our range of self-watering plastic, hardwood and metal planters only need watering weekly, so the cost savings start straight away. Less watering means fewer visits: saving time, fuel and labour costs. 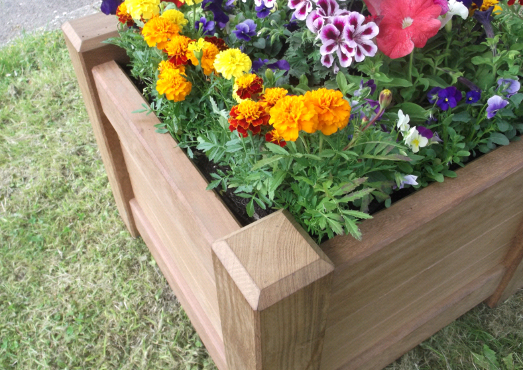 geViews timber and plastic planters are 100% recyclable. Our brand new gecoPlas range shows just how attractive and versatile recycled plastic can be. We are proud to only use timber from well-managed, sustainable forests. 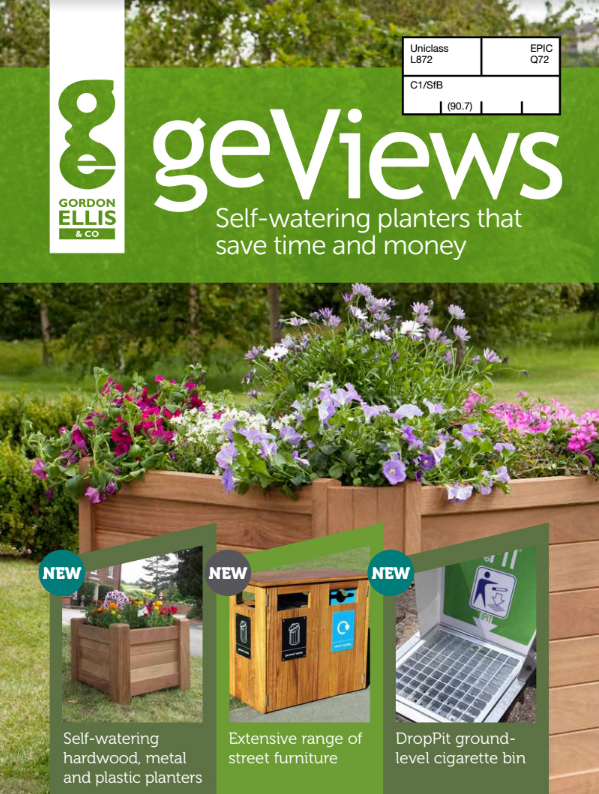 Please contact us if you would like a copy of our brochure by calling 01332 856 039 or email info@geviews.co.uk. Picnic tables are a great way of bringing people together, eating with family and friends and enjoying the great outdoors. 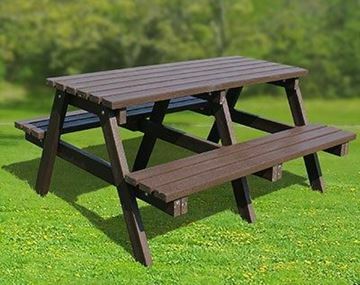 Our range of picnic tables are made in the UK from either pressure treated hardwood with a rich solvent-free stain, or from our gecoPlas 100% recycled plastic, both giving a long service life. 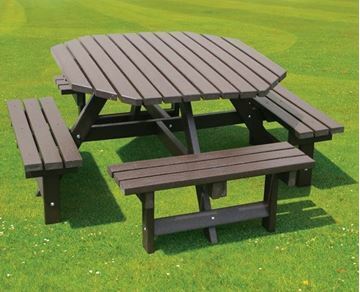 Floor fixing kits are available to resist theft and vandalism, which picnic tables can sometimes become subject to when in public spaces. gecoPlas recycled picnic bench seating eight people. 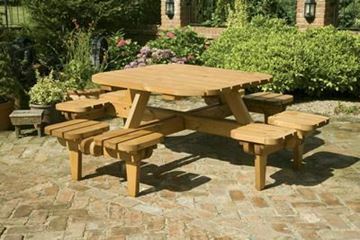 gecoPlas recycled picnic bench seating 4 or 6 people. 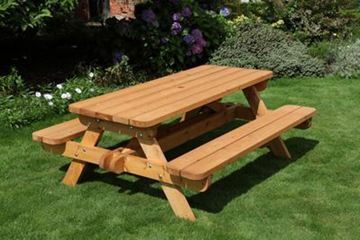 A heavy duty picnic bench for maximum strength and durability. Fold up seats to maximise space. 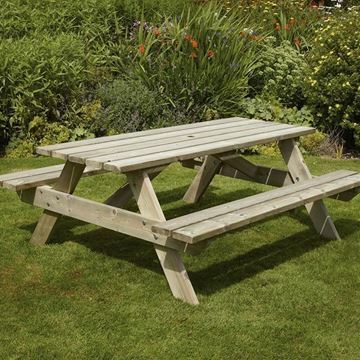 Comfortably seats up to 8 people on this sturdy square design picnic bench. Copyright © 2019 geViews. All rights reserved.